India is a country of festivals and many diverse subcultures. They’re, however, are few cultural beliefs and faiths that are common to the entire country. One such thing or cultural tradition is the making of Rangoli. 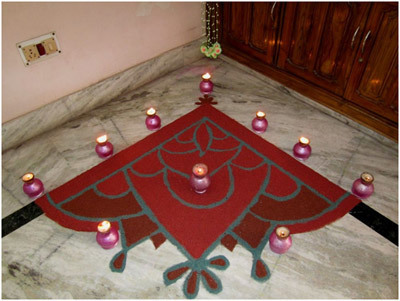 The traditional Rangoli is usually made with rice flour outside the entry to the house. Rangoli holds different significance across different culture and states of India but the general idea being the overall well being of the family. It is a way to welcome the good into life and ward off evil. What to use to make a rangoli? Earlier people only used rice flour to make rangoli and women made rangoli as the first thing in the morning after their daily bath. Today, people use a whole lot of materials to make interesting rangoli designs and patterns and add more flavour and twist to the traditional rangoli patterns. People today use coloured rice, sand, flower petals and wood and sawdust as well. Earlier the women of the house would draw elaborate designs with their hands and use of just rice flour, today there is easy availability of stencils on the market for people to use. Given the changing times and constraints of time, these stencils, artificial colours and ready-made rangoli kits have added a modern flavour to the art of rangoli making. Simple and easy: draw geometric shapes or any other patterns, designs, flowers, animals or shape you like with rice flour and let them be was an outline without filling any colours in them. Designs with Ganesh: Lord Ganesha is revered in Hindu Mythology and religion as the supreme god and worshipped before the beginning of any new venture, major religious festivities and anything auspicious. There is an easy way to make rangoli by the very designs with Lord Ganesha. While you can have a simple outline to depict the Lord or use beautiful colours and stencils to make a perfect rangoli for any occasion you want to celebrate. Here is a simple design that has Lord Ganesha design made with crispness and artful design with just white color. If you want to keep it simple, this is a beautiful rangoli for your house. Here is a colourful, artistic and simple design with beautiful imagery and drawing of Lord Ganesha. Made with beautiful and bright colours, Lord Ganesha’s image stands out with beautiful outlines. The outline and design for the square is made in simple flower petals and patterns, with the square clearly marked by flowers and corners highlighted with use of candle stands. This is a rangoli one can make for special occasions like Diwali or at functions in schools or public institutions. Making it with flowers: If you are an eco friendly person who wants to avoid extensive use of chemical colours then go eco friendly while thinking of a rangoli design and pattern with the use of flowers. You can easily buy colours from the local flower market and use them. There is little extra effort to break off the petals for better design and look of the final art piece your rangoli is. It is important to have a few designs in mind and buy flowers depending on the color combinations you want to have. This is a simple design with use of flowers, basic design and use of diyas to give it a warm effect. If you don’t have much time and are not much of an artist, try this at home with minimal use of colours and a few flowers. Less time, good output and pretty simple design for a great day or any occasion!! Here is a simple design with a little effort that would look great for any occasion, maybe just a day out of the blue or for a special occasion. 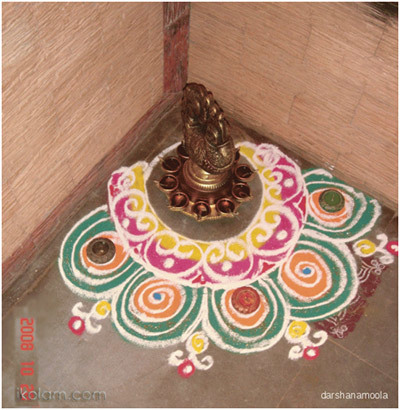 With a diya at the center of the rangoli and concentric circles made with flowers and leaves, this design has no scope of things going wrong. You can add more from the top of your mind and make it bigger and colourful. If you are willing to invest some time, energy and have the patience to ensure that you make a rangoli that leaves a mark you have to give this design a try. It needs a little eye for details and meticulous planning to set the flowers right. Here is a design that is intricate, has an eye for details and is put up with most careful hands for an amazing final result. Try this and make this design with patience and pay attention to the finer nuisances of the design and layout. Not only does it look traditional, it also is visually appealing thanks to the lovely designs. You can master and get this rangoli flower design with the use of the most easily available colours and flowers without much effort. Make sure you get some nice fresh flowers and lots of them to make this design. It is lively and colourful and will add more fun factor to any occasion. Try it, light a diya or write a message, you can not go wrong with this one. If you are looking for a rangoli design with the use of more colourful flower petals and a design that is visually entertaining and has a level of detail along with a beautiful mix of geometric pattern and a traditional touch, try this design for any big occasion, like a wedding or even during a thread ceremony. Try this if you want to have a simple yet elegant design in your house or office and rest assured that people will be happy when they see this, get ready to get some compliments for your effort and your skill to get this design right. Corner the corner with the design: It is often not easy to get a good design for the tricky places like corners in the house, the walls at 90 angles. Here are a few designs that you can try and experiment at home. One can always add a personal twist to the designs presented and shared here. After all, there is always scope for more. Draw this simple and yet delicate design in your home and get innovative by adding more diyas, lights and flowers where ever possible. Be sure you maintain the overall color harmony and balance. If you are not much of an artist, use a chalk to first draw the pattern and color later. 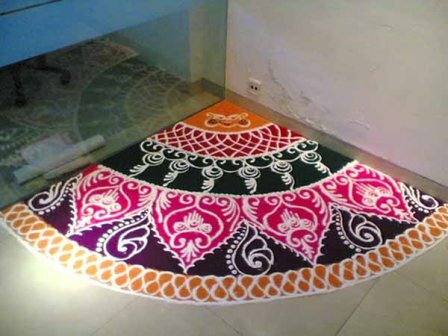 If you want a simple design for a corner of your house for any normal days or special occasion, this design adds oodles of traditional look to the whole idea of having a beautiful rangoli. 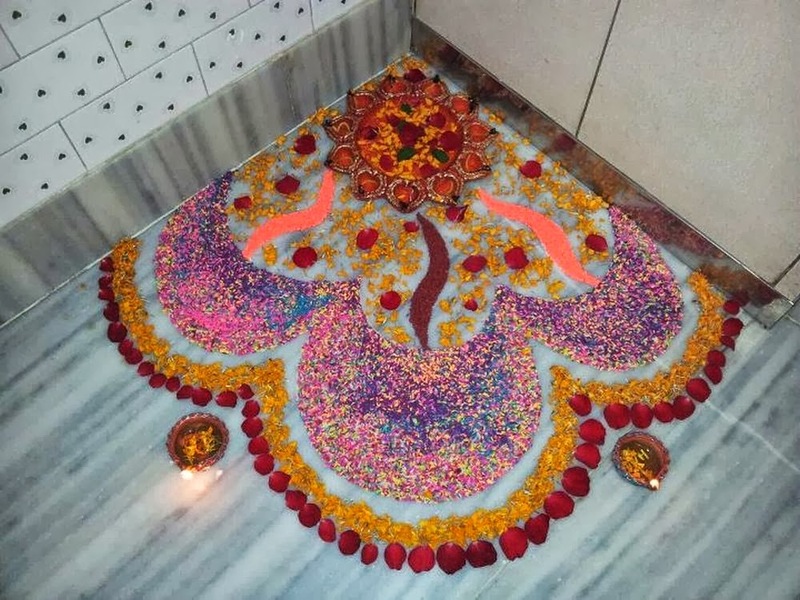 This one has a peacock placed in the center, you can add an idol of any god, animal or even decorate with some flowers and diyas for a traditional look right in front of your puja room! Make this simple and pretty design by involving your kids to also let them get the feel of tradition and festivities that are on their way. This one has good use of color, flower and lights. It will add a good flavour to the feeling of the air of a festival and allow for some family bonding time. Make this design with a mix of various colours, patterns and floral patterns in any corner of the house or office and rest assured of people’s appreciative glances. This rangoli design seems to have its own way of mesmerizing the viewer with it certain design and poise. If you are not confident about the design and are too scared or experiment or time at hand is less, try this easy way by use of stencils that are easily available today in the market. These are few of the designs I feel one cannot go wrong with. Happy Rangoli making!